At Capital Coating, we service all types of roofs. Whether you are a property manager, commercial building owner, or a homeowner, we can help you. Does your roof need repairs, restoration, or replacement? Maybe you know your roof has issues but you need a professional to do a thorough assessment and advise you as to what to do next. If you need a commercial roofing contractor in West Mifflin, PA, call Capital Coating today at (717) 442-0979 for your free roofing evaluation. As a business owner, we understand what it’s like to run a business and also keep up with all the responsibilities and annoyances that come with running your own business. When your commercial roof is giving you trouble, it can put a halt to every aspect of your business. Capital Coating can promptly address your roofing issue and present you with several options to get your business running smoothly again. Finding a commercial roofing contractor in West Mifflin with experience in all varieties of roofing is a huge plus. Capital Coating has 20+ years experience in the industry and we can handle any type of roofing project. 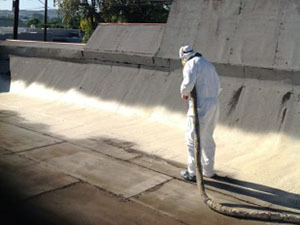 Not only do we handle commercial roofs, we also do spray foam insulation, painting, sandblasting, and more. We are your one-stop commercial building contractor. We service EPDM roofs, TPO, PVC, metal, built-up, modified bitumen, and more. Capital Coating has a solid reputation throughout Maryland, Delaware, Pennsylvania, and New Jersey. We have serviced thousands of commercial roofs and have created lifelong relationships with our clients. We treat each and every project with customized care. This has earned us an A+ rating with the BBB. We are also fully licensed and insured. Capital Coating is dedicated to protecting your investment by offering you a wide range of options for your roof. 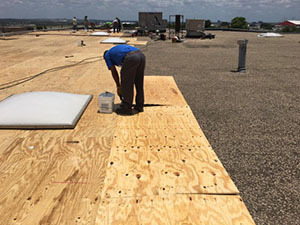 Our roof coatings are energy-efficient and waterproof and if your flat roof needs repairs, you might be interested in single-ply roofing for an easy-to-install, long-lasting roofing choice. We can tell you what’s going on with your commercial roof and give you affordable, high-quality solutions to all of your roofing issues. It all starts with a thorough inspection of your roof so call Capital Coating today at (717) 442-0979 to schedule your free roofing assessment and to see what your options are.